A space launch company bankrolled by Microsoft Corp co-founder Paul Allen intends to compete with space entrepreneurs and industry stalwarts by launching satellites into orbit from the world’s biggest airplane. 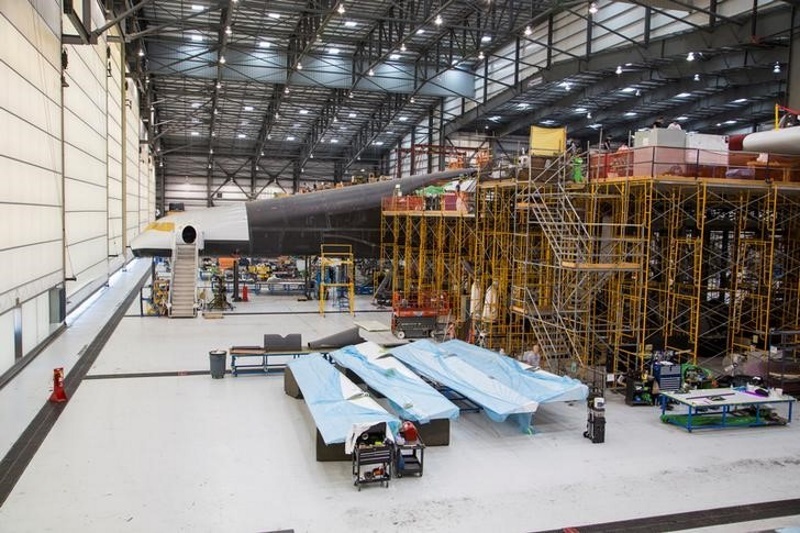 Stratolaunch Systems, a unit of Allen’s privately owned Vulcan Aerospace, last week gave a small group of reporters a first look at the nearly finished aircraft. With a wingspan of 385 feet (117 m), the six-engine plane will be larger than Howard Hughes’ 1947 H-4 Hercules, known as the “Spruce Goose,” and the Antonov An-225, a Soviet-era cargo plane originally built to transport the Buran space shuttle that is currently the world’s largest aircraft. Allen’s move coincides with a surge of new businesses planning to sell Internet access, Earth imagery, climate data and other services from networks of hundreds of satellites in low-altitude orbits around Earth. But his vision is different from what Elon Musk’s SpaceX, Jeff Bezos’ Blue Origin, Richard Branson’s Virgin Galactic and other companies have for building commercial highways to space. Musk’s goal is to fly people to Mars. Bezos is developing low-cost, reusable rockets with the goal of moving energy-intensive, heavy industry off Earth. Branson is focused on space tourism and a small satellite launcher. The advantage of Allen’s approach will be the ability to position the plane so satellites can be directly delivered into very precise orbits and do so quickly, without launch range scheduling issues and weather-related delays, Chuck Beames, who oversees Allen’s space ventures, said. The Stratolaunch plane looks nothing like its behemoth predecessor aircraft. Rather than transporting heavy cargo inside a main body section, Stratolaunch is a twin-fuselage craft that incorporates engines, landing gear, avionics and other parts from a pair of Boeing 747 jets coupled with a frame, wings and skin handmade of lightweight composites. Designed and built by Northrop Grumman Corp’s Scaled Composites, the plane is similar in form and function to Scaled’s aircraft built to ferry spaceships into the air and release them for independent rocket rides beyond the atmosphere, a service Richard Branson’s Virgin Galactic intends to offer to paying passengers. Stratolaunch plans a similar service for satellites, particularly the low-Earth orbiting multi-hundred member constellations under development by companies including SpaceX and Google’s Terra Bella to provide internet access, Earth imagery and other data. But Stratolaunch will offer quick and precise satellite positioning, a service that will set it apart from competitors. These satellite networks, based on low-cost spacecraft, are the fastest-growing segment of the global satellite industry which reported more than $208 billion in revenue 2015, according to a Satellite Industry Association report. Walking across the Stratolaunch plane’s wings offers perspective on the vehicle’s dimensions. “You could fit a football field up here,” said Beames. Assembly of the plane is 76 percent complete, with the engines, landing gear and one tail section still to be installed. The plane is expected to be finished before the end of the year. Commercial services are expected to begin before 2020. When the plane was announced in 2011, Musk’s Space Exploration Technologies, or SpaceX, was hired to provide a version of its Falcon rocket to catapult medium-class payloads into orbit after they were dropped by the Stratolaunch carrier aircraft. When that arrangement fell through, Stratolaunch looked to Orbital ATK for a booster rocket but those plans were tabled as well due to technical issues. Now, the company is mulling multiple partnerships with several rocket companies to provide launch services for small and medium-sized satellites. Human spaceflight for business and research is not in the immediate business plan, Beames said. The plane is designed to carry a rocket and payload with a combined weight of up to 550,000 pounds (250,000 kg), on par with what a SpaceX Falcon 9 rocket can launch from the ground. Allen played an early role in stimulating what has come to be called the “new space” industry, partnering with Scaled’s founder Burt Rutan to pay for development of SpaceShipOne, the first and so far only privately funded spaceship to fly people beyond the atmosphere. “Just like computing devices are rapidly changing what they can do and our way of life, access to space is changing the way we live,” said Beames. No Comments on "Paul Allen’s Space Company Nears Debut of World’s Biggest Plane"